The Rekola EVA round shaped pouch is ideal for storing a spray bottle with either water or chemicals. This pouch is also suitable for storing dry items such as brushes, small items required for the cleaning process or personal items. This pouch adds capacity to the trolley but can also be used in combination with the Rekola AddOn work belt. EVA pouches are waterproof and resistant to most cleaning chemicals. It can be cleaned easily by rinsing with water, disinfectant solution or wipe. In conjunction with utensils and trolleys, optimizing the cleaning process and reducing trafficking during the cleaning process. Suitable for any project inside or outside. EVA is resistant to most chemicals and can be disinfected. Article 10-900111 or 10-900112 in combination with the Rekola AddOn buckle belt 10-0000010 form an ideal package and saving time up to 30% according to REFA time studies. Ideally suited for use in conjunction with Rekola Motion trolleys and/or Rekola Reflex concept. Can be used with alternative brands and concepts, and machines. Rekola Addon EVA pouches are ideal to add functionality to trolleys. Increase storage capacity around the trolleys and reduce trafficking during cleaning. Storage of cloths, chemicals, brushes, garbage bag rolls, personal stuff etc. The EVA pouches are multifunctional and multi-purpose. Rekola Addon EVA pouches with stainless steel clips attach simply to machines, trolleys or belts. The Rekola AddOn EVA pouches are designed to customize and/or personalize the trolley or belt specifically for the user. They can be switched from trolley to belt easily. The Rekola AddOn work belt reduces trafficking to and from the cleaning trolley during daily manual cleaning process. 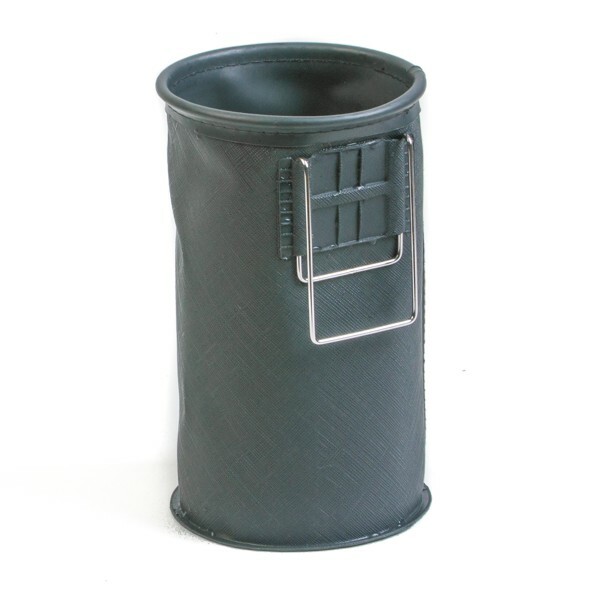 EVA pouches are resistant to disinfectant chemicals and can withstand temperatures of -20 to 100 degrees Celsius. Do not wash in Deko-machines as the high temperature may deform the shape of the pouch. When collected separately EVA and stainless steel can be used in recycling programs. Stainless steel clips ø 2,2 mm. EVA (Ethylene Vinyl Acetate), 18-20% VA, pouches with leather surface structure, waterproof welded. Extra options* *not included in price. Used in conjunction with Rekola Motion trolleys and or Rekola Addon buckle belt Article 10-900110 or Rekola Addon work belt Article 10-90013. Rekola AddOn EVA pouches offer a flexible way of personalizing or customizing your cleaning trolley, work belt and cleaning process. Multifunctional pouches means there are no limitations for use within the cleaning process. They can be mounted to sit on cleaning machines adding extra functionality and storage. As the Rekola Addon EVA pouches are extremely light and can be attached at ergonomic height levels, the products are improving and increasing the ergonomic work circumstances during the cleaning process.